Formed as a Bay Area hc/ punk rock band called Asbestosdeath, the band changed their musical direction and name and debuted as Sleep with their “Volume One” album in 1991. After Justin Marler left the band, the core lineup of Al Cisneros, Matt Pike and Chris Hakius went into the studio to record a demo cassette that they sent to Earache Records. The recording was released in November 1992 (exactly as received by the label!) 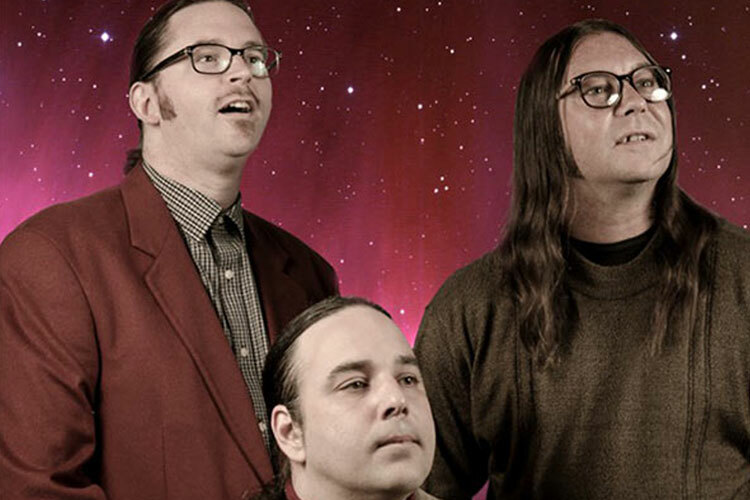 under the name “Sleep’s Holy Mountain” and went on to forever alter the musical landscape. Countless current bands cite “Sleep’s Holy Mountain” as a major inspiration, and the unique sound and style of the record can be heard in many subsequent releases by bands from all over the world. “Sleep’s Holy Mountain” created such a humongous buzz that major label London Records signed the band. Unfortunately, the label lacked the vision necessary to actually follow through and release the album that Sleep recorded, mostly because it took the not-radio-friendly form of a Single song — a 63 minute long ode to weed — called “Dopesmoker.” Sleep returned to the studio and edited the track down to 52 minutes and retitled it “Jerusalem”, but it was again rejected. London Records shelved the record and dropped the band, leading to their dissolution. “Dopesmoker” was recorded by Billy Anderson (Neurosis, Melvins) at Record Two Studio in Comptche, California While recording the song, it began to form differently than the band had originally envisioned. Pike stated that the “song was getting slower and slower and then it got weird. We started tripping out and second guessing ourselves.” Recording the album was difficult. Pike recalled that “there was so much to memorize for that album, and we had to do it in like three different sections because a reel-to-reel only holds 22 minutes. It was really cool, but it was one of the hardest things I’ve ever done in in my life.”Sleep were in the studio for one month then went home to rehearse and returned for another month. Pike noted that they ended up with two or three different versions of the song. In the aftermath of the breakup of the band four versions of the album were released. In 1999″Jerusalem” came out with a running time of 52 minutes and is a single composition split into six identically-named tracks. There are 3 different versions/releases of “Jerusalem” : (1) a rare London Records promotional disc (2) a bootleg with cover art by Arik Roper, and (3) the Rise Above/Music Cartel Records All three of these versions are edited and considered unauthorized versions. The version of the album titled Dopesmoker was released on April 22, 2003 by Tee Pee Records on compact disc and vinyl with a 63-minute running time. That version is the only version the band considers to be “authorized” and worthy of release. “Dopesmoker” stands as one of the towering achievements in recent metal history, a mesmerizing, intoxicating, and incredibly complex song that is still unrivaled in the annals of (stoner) metal. In 2011 Southern Lord was contacted by Sleeps’ Al Cisneros about the possibility of releasing a deluxe version of this classic recording. The rights to the record had reverted back to the band and Cisneros wanted to breathe some new life into the old beast. Southern Lord was overwhelmingly ecstatic about the challenge of taking the reigns of one of the most important recordings in the history of Heavy Metal! The Lord version features brand new artwork by long time Sleep artist: Arik Roper who created something specifically special for the albums’ rebirth. The biggest difference between this new version and the old releases is the phenomenal remastering job by From Ashes Rise guitarist Brad Boatright (OFF!, Noothgrush). His vision was to enhance the original recording without changing it drastically. What he has done makes this epic opus sound invigorated, more powerful with more clarity and all around unbelievably mammoth. His work was enthusiastically approved by the band and considering how focused, vigilant and protective of their masterpiece the band is, that is nothing short of a miracle! Also exclusive to the reborn version of “Dopesmoker” is a unreleased live track of one of the best songs the band ever did: “Holy Mountain”. The booklet features newly penned liner notes by the band helping shed some new light on this holy grail of a album. “Drop out of life with bong in hand, follow the smoke to the riff-filled land”! The first new song from the masters since their life changing, anthemic 63 minutes & 36 second opus to marijuana: Dopesmoker (1999)! : “The Clarity” on side A, Etching on side B. Artwork (Etching) by David V. D’Andrea. Mastered by John Golden. Recorded by Noah Landis. “The Clarity” 12” was previously only available directly from the band via their merch table or online web-store. This Southern Lord version has been recut by Adam Gonsalves/Telegraph Mastering and pressed on 180 gram vinyl at RTI.